Today it is considered a matter of course that the Earth’s blackbody temperature is minus 18° Celsius, i.e., around 255 Kelvin, whereas its average temperature is 288 Kelvin. By the early-20th century, this temperature disparity started to be called The Greenhouse Effect. Alan Siddons runs through the numbers here (11 mins. ), cross-checking with Wikipedia. wryheat – saying that ‘as you go higher up there is less air above you, and therefore less downward force due to the weight of this air’ leads to the question: what force? Weighing machines for example register no such ‘force’. I’m playing devil’s advocate here. Btw…Maxwell or Arrhenius – no contest, must be Maxwell. wryheat2. Great site you have. Will return again. What causes the lapse rate? Because this is what causes the 33 C of surface warming over and above black body. The lapse rate warms the lower atmosphere while cooling the upper atmosphere while the average remains unchanged. It is the warming of the lower atmosphere that increases surface temps by 33C. Nowhere does the lapse rate have a term for CO2. Rather the lapse rate is determined by the force of gravity, the amount of work required to compress air and the amount of water in the air. Very interesting. Playing around with the CO2 content shows some effect. With this formula the idea floated about atmospheric pressure being much higher in the Mesozoic (so giant pterosaurs could fly) turns out wrong as even a 2% increase in surface pressure brings the surface temperature up to 293K. And according to the latest scare stories that would wipe out all life as we know it. That is T causing p.
the lapse rate is determined by the force of gravity, the amount of work required to compress air and the amount of water in the air. How is work to compress air included? Would that be compatible with the tropopause being at 0.1 bar on different bodies? Obviously 0.1 bar is a pressure constant in this case. This suggests the entire atmospheric concept of climate models is suspect, to say the least. Well yes, all models of everything are wrong. Note “models” rather than calculations of proven, fixed laws. The problem with climate science is that it confuses the two. It models assumptions, then claims the intermediate results are fixed laws rather than just calculated assumptions , and that therefore the final results are proven. Time and again papers which say that “the models prove…” but models literally cannot prove anything. Alter just one assumption in the model and the results change. In this study we only use those models where daily mean 10 m wind speed has been locally bias-corrected by using the ‘Inter-Sectoral Impact Model Intercomparison Project’ ISIMIP2b calibration methodology (Lange 2016). Move swiftly onwards and hope nobody checks your work. Are any of these models based on the atmospheric pressure concept? Not very likely. As a layman, I’ve often wondered how much of the earth’s atmosphere is squashed into pneumatic tyres, gas bottles, aircraft cabins, footballs and so on. Is this subtraction from the natural atmosphere remotely significant? My apologies for being off-topic and, possibly, stupid but this seems like a friendly enough forum to ask. So the volume of that really is vast compared to man-made objects. It is so refreshing to see more & more Scientists coming out from under the AGW croud and telling it like it is. Hasn’t the 255K value been wholly debunked as due to falling afoul of Holders inequality by doing SBlaw(mean(Irrad)) instead of mean(SBlaw(Irrad)) over the surface of a sphere? The 255K is an upper bound on the temperature without an atmosphere for an object with whatever uniform surface albedo and emissivity is being used. And don’t they even include clouds in the albedo term to get the 255K? OB Would that be compatible with the tropopause being at 0.1 bar on different bodies? RC -The pressure,p of the tropopause is not standard. Compression cannot increase T = average KE of a molecule. That needs an acceleration a.
a can only be caused by a force, a push. Clive Best writes: On Venus the tropopause lies at 55 km at the top of the H2SO4 clouds where IR radiates freely to space. For Earth the pressure of the troposphere at the equatorial height is ~0.1 bar. Only the first 20 ppm of CO2 have radiative forcing. That’s because it’s logarithmic. Jonova.com has been writing about this as well for years. You can also download for free her skeptic’s handbook which explains why this is true. 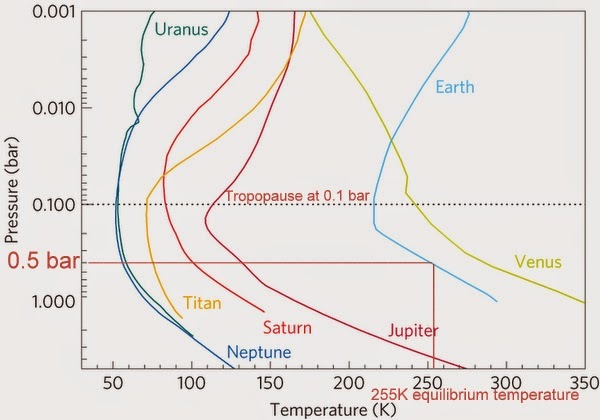 Then, in the 1980s, NASA spacecraft discovered that tropopauses are also present in the atmospheres of the planets Jupiter, Saturn, Uranus and Neptune, as well as Saturn’s largest moon, Titan. And remarkably, these turnaround points all occur at roughly the same level in the atmosphere of each of these different worlds—at a pressure of about 0.1 bar, or about one-tenth of the air pressure at Earth’s surface. “The explanation lies in the physics of infrared radiation,” said Robinson. johninboston says: Only the first 20 ppm of CO2 have radiative forcing. Possibly, but convection undermines radiative forcing theory. I know this will not be popular but I believe that Nikolov and Zellar are completely wrong. Their claims are not supported by the Physics. A gaseous atmosphere in equilibrium in a spherical gravitational field does not draw its energy from the gravitational field. 3/2 k T of energy – where k is Boltzman’s constant and T is local average temperature. If an atmosphere contained zero energy all the atoms would be frozen out on the surface of the planet. 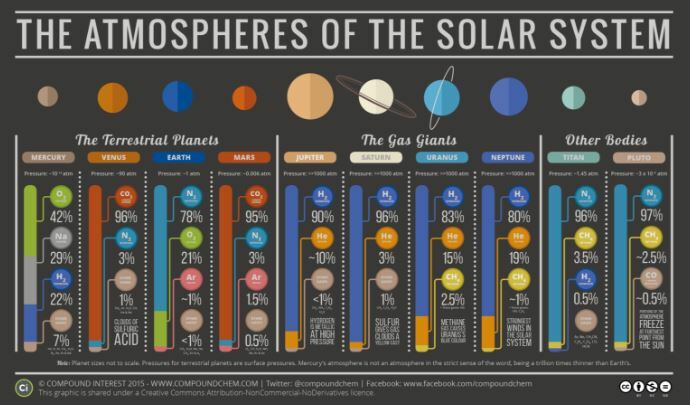 The atmosphere’s average temperature would be 0 K = -273 C.
If no energy is added to the atmosphere either from the planet below, or from space, then whatever energy is present in the atmosphere will be slowly lost to space by radiation, until the atmosphere returns to the zero energy state. they will redistribute this energy amongst all of the particles that make up the atmosphere in such a way that they establish a temperature and pressure profile (with height) that produces an energy loss from the atmosphere that balances the energy gains. In other words, the height (i.e. GPE) and temperature (i.e. KE) of any given particle in the atmosphere [and hence the equilibrium temperature and density profiles with height] will simply be a result of the way in which the atmosphere responds to ensure that the total energy loss perfectly balances the total energy gain. the local temperature of the atmosphere at a given point above the ground will simply be determined by the average speed (or average KE) of the atoms and molecules at that location. Similarly, the GPE of the atoms and molecules will be determined by the height of the particles above the ground. T is caused by gravity,g and height,h. How do g and h cause T? T is determined by velocity,v and g is a force which causes acceleration,a. I suggest g accelerates the v of molecules. Imagine a molecule which moves from the tropopause at 20km, 220K ( 450m/s) to surface at 290K( 500m/s). The change of v ( delta v) is 50m/^2. The change in g is 0.06m/s^2. Change of height is 20km. It is not a boundary value problem. Thank you, oldbrew, re question about tyres &c.
There’s a lot of thermal transport capacity for parcels in the 1-100 um range. These have a long enough coherence time and enough particles that adiabatic heating and cooling actually matter. Below 0.1 bar, there are some other effects that start to matter. One of these is that velocity has an effect on mean free path (always), and this starts to produce significant effects at low densities. Essentially, higher elevations are ‘seeing’ the hotter molecules from below. It seems to me you are using 2 different models. velocity, mean freepath and molecule are statistical gas concepts. What are the significant effects, and what are low densities? Yes, I’m looking at two different models. One is dominated by small scale fluctuations, and the other individual particles. I’ve spent a lot of time looking at the vertical gradient problem. Using statistical mechanics and the canonical ensembles runs into a problem of completeness. It does not currently support any modelling of persistent correlation. I’ve toyed around with the idea of adding quasi-particles to the ensemble (phonons, modons), but that gets ugly really fast. An alternate approach is to use some kind of hydrodynamic model, but that also gets ugly when you try to include fluctuations. Navier-Stokes particularly becomes unsolvable for all systems which include fluctuations. As for the other effects under gravity I mentioned has an increasing temperature with altitude. The lower bound in our atmosphere is about 1 milli-bar (mesopause/turbopause level).